An evolution equation model is provided for the two-slit experiment of quantum mechanics. The state variable of the equation is the probability density function of particle positions. The equation has a local diffusion term corresponding to stochastic variation of particles, and a nonlocal dispersion term corresponding to oscillation of particles in the transverse direction perpendicular to their forward motion. The model supports the ensemble interpretation of quantum mechanics and gives descriptive agreement with the Schrödinger equation model of the experiment. 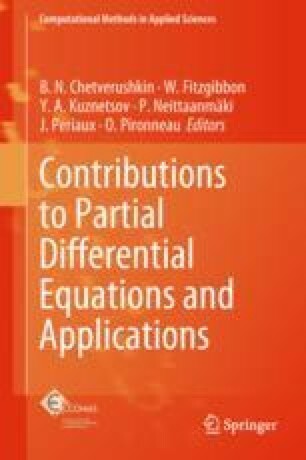 This work is dedicated to William Fitzgibbon and Yuri Kuznetsov in honor of their most valuable contributions to mathematical research and the community of mathematical researchers. for \(f \in X\), \(t \ge 0\), \(-\infty< x < \infty \). Then \(\exp (t B)\), \(t \ge 0\), is a group of positive linear operators in X with infinitesimal generator B satisfying \(|\exp (t B) | \le 1\), \(t \ge 0\) (see [41, p. 244]). If also, \(x^2 f(x) \in L^1(-\infty ,\infty )\), then the mean of \(\exp (t B)f = \) the mean of f and the variance of \(\exp (t B)f = \) the variance of \(f + 2 t \beta \).